Bix was born on Tuesday evening March 10, 1903, the son of Bismark Herman and Agnes Jane (Aggie, Agatha Hilton) Beiderbecke. He lived at 1934 Grand Ave., Davenport, Iowa. His father was Manager of the East Davenport Lumber and Coal Company. His mother was a musician who played piano; she also was the organist for The First Presbyterian Church. Bix had one older brother Charles Brunette (Burnie) and one sister Mary Louise (Sis). Bix started kindergarten in 1909 at Tyler School, formerly known as #9. His school records show the name Bismarck; he attended there thru 8th grade. The school was across the street from his house, but it is now a public park. He attended Davenport High School in 1918 until 1920. In September 1921, he was enrolled in Lake Forest Academy, and later expelled on May 21, 1922. His first gig was in 1921 at Hayne's Dancing School under his own name, The Beiderbecke Five. After leaving Lake Forest, he played with several bands around Chicago and Davenport, joining the Wolverine Orchestra in 1924. In October 1924 Bix leaves The Wolverines and joins The Jean Goldkette Orchestra. He comes home in 1925 and briefly attends the University of Iowa, February 2-20. He returns to play with Jean Goldkette. In October 1927, Bix joins Paul Whiteman. The Whiteman Orchestra, who had its own train, was on national radio, and played every major concert hall in the USA, including Carnegie Hall where Bix played his own composition "In A Mist." Bix continued with Whiteman until September 1929. Bix was a genius, a jazz pioneer according to his peers and music historians. He wrote the compositions In A Mist, Candlelights, In The Dark and Flashes, as well as Davenport Blues. Bix was known as the ultimate gentleman and in those days it wasn't considered proper to turn down a favor, including someone buying him a drink. He eventually became dependent on alcohol, a disease which contributed to Lobar Pneumonia and his death on Thursday August 6, 1931 at 9:30 pm at the age of 28 in his Queens, New York apartment. His mother and brother Bernie were on their way to NYC but arrived too late. His body was returned to Davenport with services on August 11, 1931 at Hill & Frederick's Funeral Home, and burial at Oakdale Cemetery, 25th & Eastern Ave.
Bix Society Historian Gerri Bowers is one of the most knowledgeable and most respected authorities on Bix Beiderbecke. Her work on sharing the story of his life is tireless. While looking through old photographs her husband Kent had found, she made a remarkable discovery that has not previously been shared. Thanks to Gerri for her dedicated efforts and research in putting together this remarkable story. My friend Rich Johnson always said, "More info would turn up on Bix in the future!" Some time ago I was given a binder with some old photos of Bix, other family members and friends, from the estate of Rick O'Dette. There was a rather poor copy of a photo of the R.O.T.C. unit at Davenport High School. In showing this to my husband he remarked, "We had found a similar image at an estate sale a few years back." Digging in our archives turned up 2 beautiful 12 x 14 cabinet cards with photo images measuring 9 5/8 x 7 5/8 clearly showing all the members of DHS R.O.T.C. unit. The photos were taken by Hostetler Studio dated 1920. We already know Bix was at Davenport High in the spring and fall of 1918, 1919, 1920 and the spring of 1921. I had to take a closer look at our photo. I found Bix within seconds: he had sergeant stripes. The focus of JROTC was on secondary schools. High schools were authorized the loan of Federal Military instructors with a minimum enrollment of 100 students over the 14 years of age. 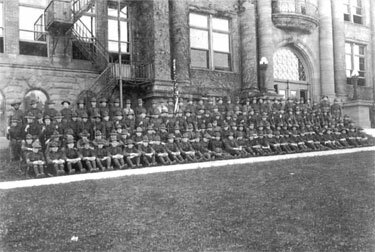 From 1916 - 1919 the army established units at only 30 schools. 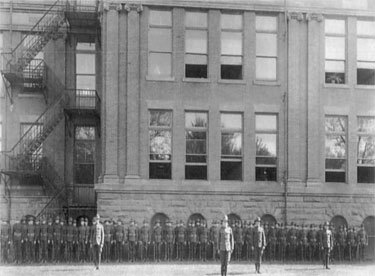 The first unit was at Leavenworth High School in Kansas. It had a modest beginning of 6 units in 1916. During 1919 - 1920 they had 45, 000 students. It was mandatory. The cadets had 3 hours of military instructions per week for 3 years. "Military Work Will Be Added to High School"
Board votes to install compulsory service next semester. In adopting military training, the school board approved a resolution recently adopted by the board of education at Cleveland, Ohio, copies of which have been sent to 200 large cities and towns. The resolution is addressed to President Woodrow Wilson, Secretary of War, N. B. Baker, and members of congress urging the adoption of universal military service. Of H.S. Volunteers Of U.S."
All students over the age of 16 years to take military training. It has hundreds of schools throughout the country following its plan and Davenport can now stand proudly in this list. It is known that the Juniors and Seniors and all others over the age of sixteen years of age will take this training and that they may substitute it for physical culture. It is understood that the government will furnish equipment, not including uniforms, which will be arranged for in some other way. It means simply that there will be over three hundred uniformed cadets in the High, all of whom will learn the elements of self defense. This was found at the Davenport School Museum, 1616 Brady Street. Following World War I, federal money became available for High Schools to offer military training for their students. D.H. S. started this program in 1919. Many facets of military training were included in the program. Fall dress inspections and parades were held. In the early 1960's the program was dropped due to lack of interest plus diminishing funding from the army. "G.A.R. Ladies Give Flag to R.O.T.C." As a mark of recognition for their works and aims, the Ladies of the Grand Army of the Republic presented the Reserve Officers Training Corps unit of Davenport High School with a regulation parade flag. The Parent - Teachers of Davenport High School held a party for the students. The final exhibition was staged by the R.O.T.C., the military organization under the direction of Captain James W. Peyton. An awkward squad was first with a series of maneuvers, showing what the instructor first found in military material and later how it was developed. Accordingly a crack platoon was summoned and these 40 boys in uniform presented several divisions of their army training. The final piece was a tableau. Liberty was standing on a pedestal surrounded by men & boys portraying steps in America's defense; directly behind were assembled in semi-circle the entire R.O.T.C. unit as a fitting background. School Cadets from Davenport Lend Military Touch to Scene"
Honor emblems of gold, silver, and bronze designed and manufactured at the Rock Island Arsenal were presented to 40 employees. The awards were made to workman, who have spent from 30 to 50 years in service of the government. A detachment from the Reserve Officers Training Corps from Davenport High, under the command of Captain J.W. Peyton, added a military touch to the presentation. A detachment from the Reserve Officers Training Corps from Davenport High under the command of Captain J.W. Peyton added a military touch to the presentation. Capt. James F. Byrom, United States Army, has been assigned to Davenport High School as commanding officer of the R.O.T.C. He has been ordered here immediately for his new work and is expected within a few days. He is coming from a Military Academy at Waynesboro, Virginia. He will replace Capt. J.W. Peyton, who is on the army's retirement list. "H.S. Cadets To Be In Line"
For the Armistice Day parade Thursday morning will march the cadets of the Reserve Officers Training Corps of Davenport High School. Arrangements have been made to excuse members of the corps from school class work. A Junior Unit of the R.O.T.C. has been established in the Davenport High School by the War Department. This unit is under the instruction and command of two regular army officers. The government supplies the complete equipment without any cost to the individual including arms and ammunition. Last year, under the capable and effective guidance of Major Peyton, the unit was carried through the difficulties and was rounded into such excellent shape that it was placed first among all the junior units of this district. Under Capt. Byrom the unit was organized into two companies. Drill progressed smoothly and rapidly until Capt. Byrom was promoted to the rank of Major, and was removed to his former position in Virginia. Robert Carmody, Major of Cavalry, was assigned to fill the place left vacant by Major Byrom. Yes, Bix was a member of the Reserve Officers Training Corps program at Davenport High. The 1st photo shows Bix with sergeant stripes. He is sitting down, #1 on the left hand side. 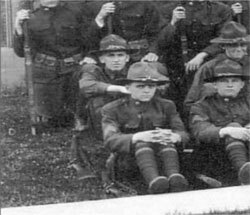 The 2nd photo, Bix is standing #37 from left, he is right behind the second platoon leader. 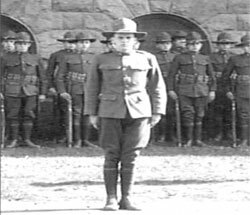 In the first photo, Raymond Moore is the first cadet standing right behind Bix. Raymond sang with Bix in 1920 D.H.S. Musical Program at the Grand Opera House. They sang "Black Jazz Babies". Friends of Bix's in R.O.T.C. Since knowing that R.O.T.C. was mandatory, many of Bix's friends were right there with him: Erskine Albright, George VonMaur, Karl Vollmer, Larry Andrews and Raymond Moore.